The sixteenth installment of the Mystery Trackers series from Elephant Games is now available. Today and tomorrow only, you can also get any additional Collector’s Edition and/or standard version games for half off when you purchase the Mystery Trackers: The Fall of Iron Rock Collector’s Edition. Just add the CE to your cart along with any additional CEs and/or standard version games and then use the coupon code TRACKERS at checkout to receive the additional games for half off. Offer expires April 19, 2019 at 11:59pm Pacific. Today only, all games at Big Fish Games are 50% off when using the coupon code SAVE50 for Collector’s Editions and/or the coupon code GAMES for standard version games at checkout. Offer expires April 17, 2019 at 11:59pm Pacific. Try these games or any games at Big Fish for free! Get a one-hour — or longer — free trial of every game. Start here. Today only, Collector’s Editions are 55% off at Big Fish Games when you use the coupon code CE899 at checkout. Offer valid for both PC Games and Mac Games, expires April 16, 2019 at 11:59pm Pacific. All time management games at Big Fish Games are half off when using the coupon code TIME at checkout. Offer expires April 15, 2019 at 11:59pm Pacific. Today and tomorrow only, all games at Big Fish Games are 60% off when using the coupon code WEEKEND for Collector’s Editions and/or the coupon code SAVINGS for standard version games at checkout. Offer expires April 13, 2019 at 11:59pm Pacific. Today only, standard version games are $4.99 each at Big Fish Games when you use the coupon code SAVE at checkout. Offer valid for both PC Games and Mac Games, expires April 10, 2019 at 11:59pm Pacific. Game Club Sale! All games at Big Fish Games are 50% off when using the coupon code GAMECLUB at checkout. Offer expires April 9, 2019 at 11:59pm Pacific. This brings standard version games down to just $3.49 each and Collector’s Editions down to $6.99 — and you’ll still earn punches on your monthly punch card for each game. Sunward Games brings you the latest installment of the Endless Fables series. Today only, you can get up to 10 additional Sunward Games standard version games for $2.99 each when you also purchase the Endless Fables: Shadow Within Collector’s Edition. Just add the CE to your cart along with up to 10 bundle sale games below and then use the coupon code FABLES at checkout to receive the bundle sale games for $2.99 each. Offer expires April 8, 2019 at 11:59pm Pacific. 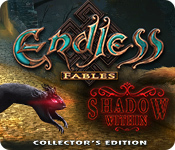 Try Endless Fables: Shadow Within Collector’s Edition for free with a 90-minute free trial at Big Fish Games! This weekend, buy one Collector’s Edition and get one free when you use the coupon code RAINBOW at checkout. Offer expires April 7, 2019 at 11:59pm Pacific. Try these games or any games at Big Fish Games for free! Domini Games brings you the latest installment of the Mystery Tales series. Today and tomorrow only, you can get any additional Collector’s Editions for half off when you also purchase the Mystery Tales: Dealer’s Choices Collector’s Edition. Just add the CE to your cart along with any additional CEs and then use the coupon code TALES at checkout to receive the bundle sale games for half off. Offer expires April 5, 2019 at 11:59pm Pacific. Try Mystery Tales: Dealer’s Choices Collector’s Edition for free with a 90-minute free trial at Big Fish Games!